The fall migration of Monarch butterflies is one of those fascinating natural mysteries to which human beings still do not have any answers. For centuries, the black and orange Monarchs have been great winter attractions in the Californian and Mexican regions. However, no one had any clue to this huge influx of Monarch butterflies in these regions. In 1937, part of this mystery was unfolded through the attempts of a researcher named F. A. Urquhart; he began putting wing tags on the butterflies in order to track their origins and whereabouts. His endeavors bore results and it was brought to light that the Monarch butterflies were original natives of the northern regions. The winged beauties soared and glided in the sunlit skies across USA from March through October. Come winter, and they would migrate to the warmer regions southwards to avoid the cold winds, returning to their summer grounds in the wake of spring. The migration and the life cycle of a Monarch butterfly continue to puzzle human beings. 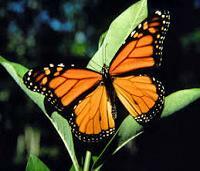 Studies have established that a Monarch butterfly completes a round trip only once in its entire life cycle. With an average life span of about 6-8 weeks (of one generation through the various stages - egg, caterpillar, chrysalis, butterfly), the migration chapter is not covered in a single generation. In fact, it is the fourth generation Monarch butterflies that take the long flights (ranging to some 1800-2500 miles) from their summer homes to their winter roosting spots traversing many mountains and forests in their way. The first three generations complete their life cycles in the northern regions. The fourth generation butterflies attain maturity at the onset of Fall. These adults are slightly different from the summer adults; they do not mate rather take to flight to keep warm. Monarch butterflies east of the Rocky Mountains migrate to the Oyamel fir trees of Mexico and the ones west of the Rockies migrate to the eucalyptus trees of Pacific Grove and surrounding areas in southern California. The fall generation Monarchs hibernate in their warm nesting grounds of Mexico and southern California until the arrival of spring when they wake up to mate and migrate back to the summer homes. There they lay eggs and die. In spite of the most sincere researching, Monarch butterflies have remained an enigma for humankind. We yet do not have any explanation to how these little winged creatures keep revisiting the same trees year after year and that being fourth generation offsprings! Article Source/Author: David Maillie is an alumni of Cornell University and holds numerous patents and awards for his research. For more interesting products and useful information like this please visit http://www.mdwholesale.com and http://www.bestskinpeel.com. Watch his amazing documentary about the unique flight migration of the majestic Monarch Butterfly.